Marvel's Agents of S.H.I.E.L.D. Season One Declassified - published by Marvel - in all its glory. I was sitting having lunch during a break on the set of Agents of S.H.I.E.L.D. with three of the amazing Marvel folks that work on the show, Megan Thomas Bradner, Samantha Thomas and Emma Fleischer. As often happens on a film set, the conversation turned existential and we started talking about things that we've always wanted to do in our lives. As a kid growing up in Franktown, Colorado my only exposure to the behind the scenes of films and TV were the short segments on Entertainment Tonight, Scott Patrick's occasional Hollywood One-on-One show that aired at one in the morning on KUSA, and the amazing "Making Of" books that were readily available at the library. Lengthy love letters to films that poured over every detail, gave you glimpses at concept art, behind the scenes photos, deleted scenes, and storyboards that gave you a slice of what it was like to be a part of the production. I probably still hold the record for most times Alan Arnold's Once Upon a Galaxy: A Journal of the Making of Empire Strikes Back was checked out from the Parker Public Library. Don Shay and Jody Duncan's Making of Jurassic Park was a volume that read cover to cover more times than I could count on family road trips. 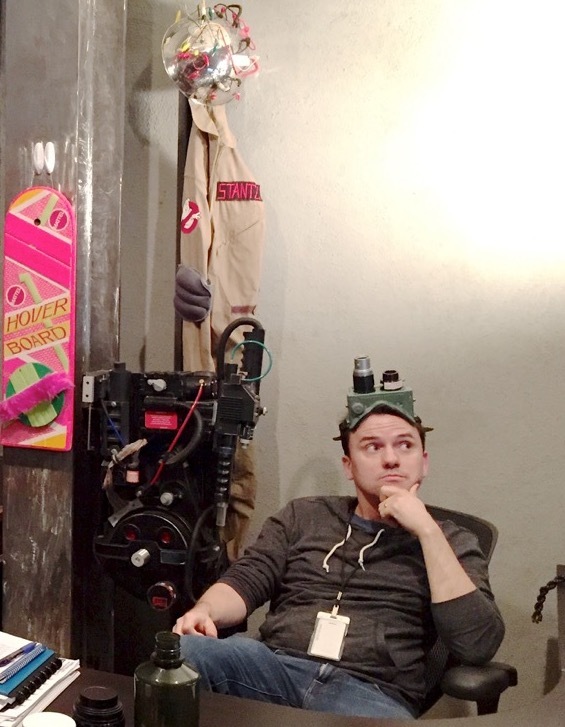 I still guard a copy of Making Ghostbusters as if it were my birth certificate. And J.W. Rinzler's amazing Making Of books for the Star Wars trilogy as of late have been absolutely outstanding. So, in that moment at lunch, I mentioned that I'd always wanted to write making of books like those I had grown up reading. I don't know where it came from. Like Ray Stantz says, "it just popped in there." But apparently those three amazing Marvel execs took note, and several weeks later they had vouched for me and helped me embark on my first adventure as a Making Of book author. My wife was kind enough to photograph me like Christmas morning when the final copy arrived via FedEx on 7/11/14. In the introduction of the book, you'll read that I had the pleasure of chronicling one of the most welcoming and familial sets on which I've ever had the pleasure of working. One of the absolutely enduring things about some film sets is that a bond is created with those that work on the show and no matter what the challenges are, that warm kindness never fades. Long days and late nights didn't stop many from always greeting me with a smile and a handshake or a chuck on the shoulder. You often hear people speak of their sets feeling like a family, but this is one that it's the absolute truth. What resulted with the book is a cool hybrid between an episode guide and analysis, behind the scenes, and a reference book that makes me immensely proud. My hope is that it gives fans old and new a background on the series' origins, some insight that helps them see the series through the writers room's eyes, and that it's something that can be read and re-read as many times as I tore through that Making of Jurassic Park book. Marvel always does such an incredible job with their Art Of books, that I can only hope this is a fitting companion to those awesome compilations. Sabrina Arnold, Scott Bauer, Jeffrey Bell, John Bernstein, Thomas Boucher, Megan Thomas Bradner, Garry A. Brown, Sarah Brunstad, Katie Carroll, "Chewie", Marc Christie, Gary D'Amico, D.J. Doyle, Allen Easton, Sarah Halley Finn, Emma Fleischer, Brent Fletcher, Ann Foley, Blair Foord, Shalisha Francis, Kenn Fuller, Tanner Gill, Tamara Hunter, Kyle Jewell, Rafe Judkins, George Kitson, Mark Kolpack, Harmony Kummer, Brian Kwan, Lauren LeFranc, Jeph Loeb, Lee Malin, Geoffrey Mandel, Bear McCreary, Gregory Melton, Monica Owusu-Breen, Denise Anderson Poore, Corey Reeser, Greg Rementer, Nelson Ribeiro, Erin Shade, Arune Singh, Daniel Spilatro, Sonya Strich, Samantha Thomas, Aiyana Trotter, Joe Quesada, John Vertrees, Jed Whedon, Joss Whedon, Maurissa Tancharoen Whedon, Maileen Williams, Jeff Youngquist, Paul Zbyszewski and so many others including the amazing cast who was so patient with me, that it's not even funny. The truth is, I had the time of my life working on this book. For me, having that volume on my shelf will remind me of the amazing time that I had and the incredible people that I met in the process. I'm so tremendously grateful to have been a small part of everything, and can't wait to take all that I've learned from them into whatever the next adventure may bring. Posted on July 29, 2014 by Troy Benjamin and filed under TV, SPT News and tagged marvel's agents of s.h.i.e.l.d. season one declassified marvel comics maos agents of s.h.i.e.l.d. shield marvel agent coulson phil coulson.